Pumpkin Girl celebrates one of the classic traditions over the Halloween Holidays, the age-old carving of the ‘Jack O’lantern’. For centuries, this ritual has been performed in the days leading up to All Hallows’ Eve and placed on porches and doorsteps around the world in either superstition to ward off evil spirits or merely as festive decoration. This year’s character brings to life the essence of that custom. 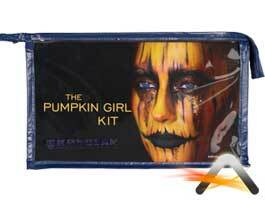 The Pumpkin Girl Kit contains every product needed to create this traditional Halloween look. It also comes with a visual step-by-step guide explaining the techniques and products in detail.